New! Click on the map dots to view record details. 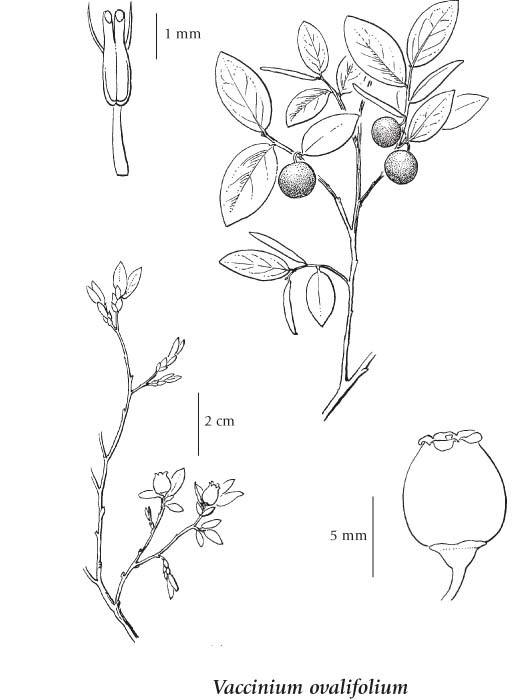 Click on the image below to view an expanded illustration for this species. Erect, spreading shrub; stems 0.4-2 m tall, angled; glabrous; young twigs brownish to yellowish or reddish; old branches greyish. Alternate, deciduous, oval to broadly egg-shaped, 1-5 cm long, 0.7-3 cm wide, blunt at both ends, entire or sometimes very slightly toothed, glabrous, more or less with a whitish bloom on the lower surfaces. Solitary in leaf axils, appearing before the leaves have reached half their mature size; flower stalks 1-8 mm long, strongly curved downward in fruit, not enlarged immediately under the berry; corollas pinkish, tubular urn-shaped, about 4-7 mm long, usually longer than wide, widest just below midlength; calyces shallowly lobed, the lobes deciduous (rarely persistent) in fruit; filaments glabrous, shorter than the anthers; anthers awned, with terminal pores. 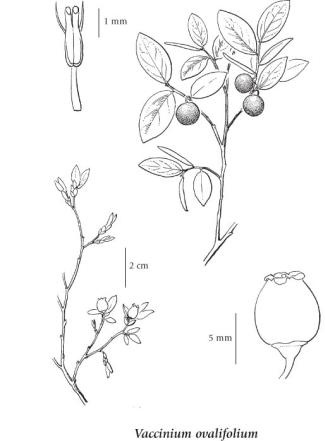 Berries, globe-shaped, 6-9 mm wide, purplish-black to bluish-black, mostly with distinct bluish bloom; pleasantly tart. Mesic to wet forests and openings, and bogs in the lowland to subalpine zones; common throughout C and S BC; amphiberingian, N to AK and S YT, disjunct to ON, MI, PQ, NF, and NS, and S to OR and MT; E Asia. original data (BEC database) provided by the BC Ministry of Forests and Range. A shade-tolerant, submontane to subalpine, Asian and transcontinental North American deciduous shrub mostly in the Pacific and Cordilleran regions, rare in the Central and Atlantic regions. Occurs on fresh to very moist, nitrogen-poor soils with boreal, cool temperate, and cool mesothermal climates; its occurrence increases with increasing latitude and decreases with increasing continentality. The climate type for this species, as reported in the: "British Columbia plant species codes and selected attributes. Version 6 Database" (Meidinger et al. 2008), is not evaluated, unknown or variable. BC Ministry of Environment: BC Species and Ecosystems Explorer, the authoritative source for conservation information in British Columbia. Disclaimer: The information contained in the E-Flora atlas pages is derived from expert sources as cited in each section. This information is scientifically based. E-Flora also acts as a portal to other sites via deep links. As always, users should refer to the original sources for complete information. E-Flora BC is not responsible for the accuracy or completeness of the original information. © E-Flora BC: An initiative of the Spatial Data Lab, Department of Geography UBC, and the UBC Herbarium.